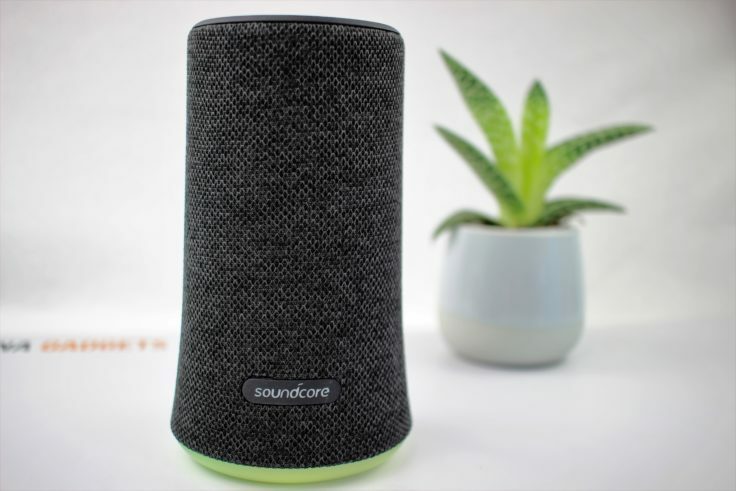 With the Anker Soundcore Flare, the Chinese manufacturer is expanding its portfolio to include a 360° outdoor speaker with IPX7 protection class, 12-hour battery life, BassUp Mode and RGB LEDs. Sounds promising at first, but is the speaker convincing in practice or is there a better alternative? The accessories of the Anker Soundcore Flair only include a user manual in eleven different languages, including English, and a Micro-USB charging cable. 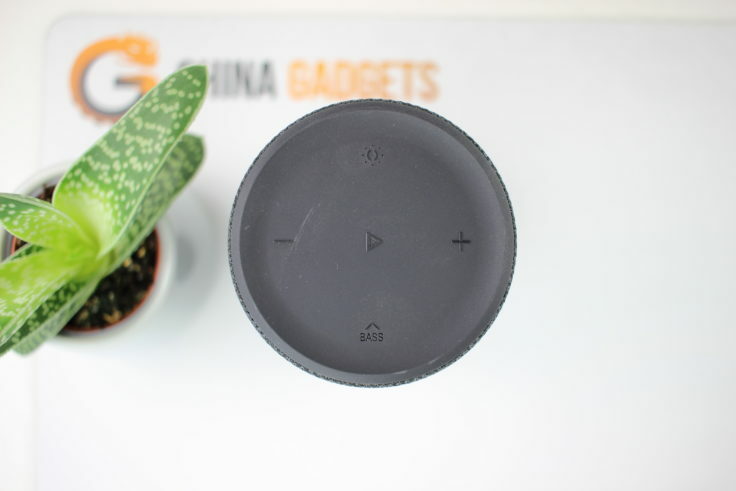 Like Anker and other Chinese manufacturers such as Aukey, TaoTronics or Tronsmart, who sell their products mainly through an Amazon shop, the outdoor speaker is solidly crafted. Even a closer inspection did not reveal any processing or material defects. Similar to the Tronsmart T6 360° Speaker, the speaker is equipped with a textile jacket. 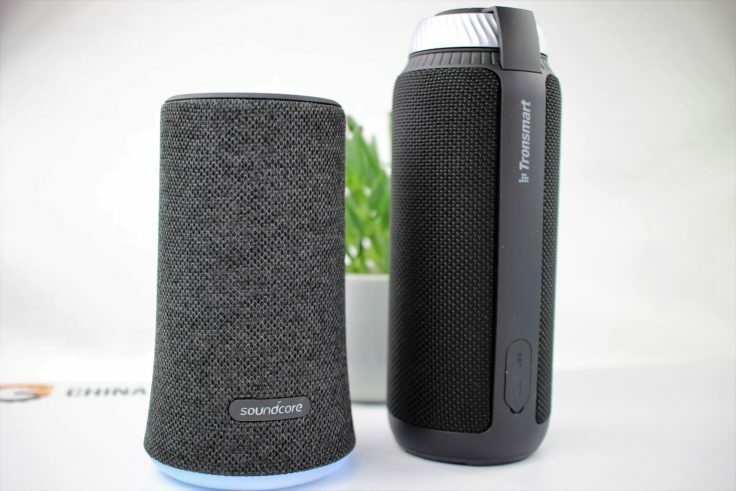 However, the jacket of the Anker Soundcore Flare is waterproof, which does not apply to the Tronsmart speaker. With the strange shape, which I haven’t seen so often with Bluetooth speakers from China before, the diameter of the speaker is 89 mm on the underside and 75 mm on the top. With a height of 151 mm it is about 44 mm smaller than the Tronsmart T6. The weight of the Anker Soundcore Flare is okay with 530 g and should not be too much of a luggage item. The design of the loudspeaker, which is only available in black with grey textile sheathing, is overall simple. For colour accents, however, an individually switchable LED ring was implemented on the underside of the loudspeaker. In my opinion it’s a gimmick, but it could also be useful for long evenings outdoors. 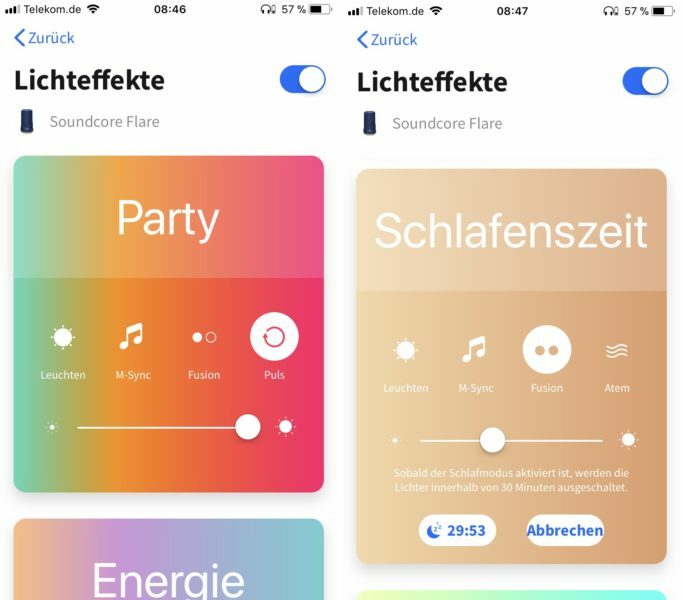 The LEDs can either be operated directly on the loudspeaker at the push of a button or by means of a smartphone app, here the range of settings is even larger. The outdoor loudspeaker is equipped with two neodymium drivers, each delivering 6 watts of power. These are each implemented on the opposite sides, resulting in the advertised 360° sound. In the test I liked the sound of the speaker for an outdoor speaker. The drawback of most IPX7-certified speakers is that they often manage with a weaker bass than speakers without IP protection. This is mainly due to the largely closed cabinet, which does without bass reflex channels and usually also passive radiators. This is also the case with the Anker Soundcore Flare. The loudspeaker convinces me with its clear tweeter and solid midrange. Low bass frequencies are sufficiently available and can be amplified with the BassUp Mode at the push of a button. If you compare the loudspeaker directly with the Tronsmart T6 or the JKR KR – 1000, however, you will soon hear that the Anker Soundcore Flare can produce less volume and depth in the lower midrange and bass range than its opponents. In the test we simply put the loudspeaker into a water bath for half an hour. Meanwhile the speaker has continued to play music without any problems, even though the sound has become a bit duller overall. After the tests, it took about two hours for the speaker’s textile jacket to dry completely again. It didn’t suffer any damage, so the Anker Soundcore Flare can justifiably be called an outdoor speaker! The connectors of the Anker Soundcore Flare are hidden behind a thick rubber cap. These are the Micro-USB charging port and a 3.5mm AUX connector. The loudspeaker has a total of seven control buttons, four of which are implemented on the top of the loudspeaker and two on the rear, above the connections. Despite the quite high number of buttons, some of them are double occupied. The buttons are under a waterproof rubber coating. The app offers some additional functions which cannot be operated with the buttons of the loudspeaker. It is available for free in the AppStore as well as in Google PlayStore. In the test, the design and functionality of the apps are completely identical. 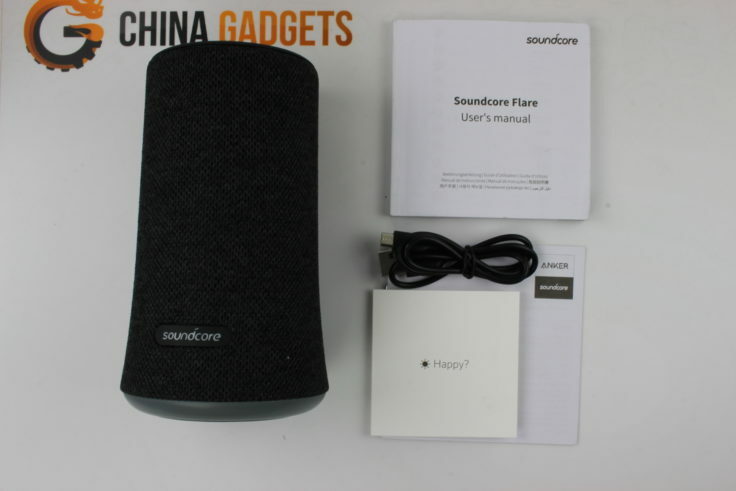 The first step is to select the appropriate loudspeaker of the SoundCore range, in this case the SoundCore Flare. In addition, the app has been developed for another loudspeaker, which is apparently not yet on the market. 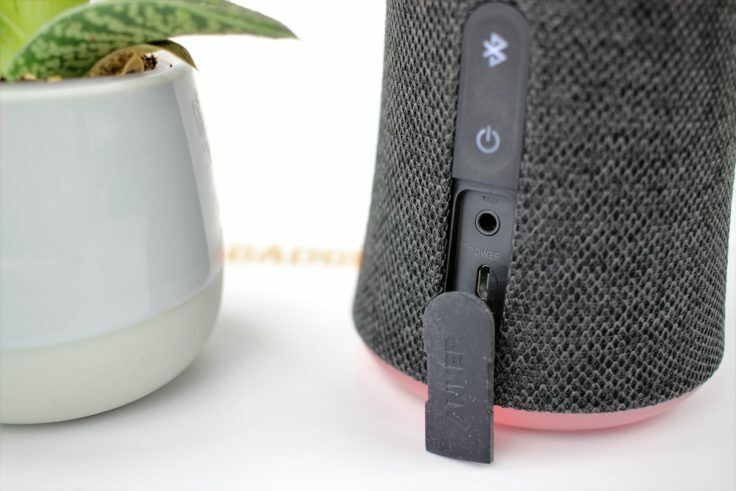 To connect the app to the Anker SoundCore Flare, the speaker must be connected to the smartphone via Bluetooth in advance. Afterwards all functions of the app are available. In the app, different colour combinations were combined to create different mood scenarios. In the app, they are called party, energy or bedtime, for example. In addition, there are different colour changing modes, for example to the beat of the music, pulsating. In addition to the BassUp mode, various equalizer presets can be selected in the sound settings. An individual adjustment of the equalizer is unfortunately not possible, too bad! In the test I liked the standard mode with bass-up mode switched on best. But also the voice mode may be interesting for audio books. All in all I like the app very much, it is comprehensibly translated into German and other languages and works error-free in the test. Unfortunately the equalizer and also the color of the LEDs cannot be adjusted individually, but you are forced to use presets of the manufacturer. The battery of the Anker Soundcore Flare has a capacity of 4400 mAh and, according to the manufacturer, should last up to 12 hours. In the test, the speaker lasted about 11 hours at medium volume and without LED light. With the LEDs switched on, the battery life should be a bit shorter. The Anker Soundcore Flare is a solid loudspeaker overall. It has a solid finish and, thanks to app control and LED light, offers some functions that not every loudspeaker has for a long time. 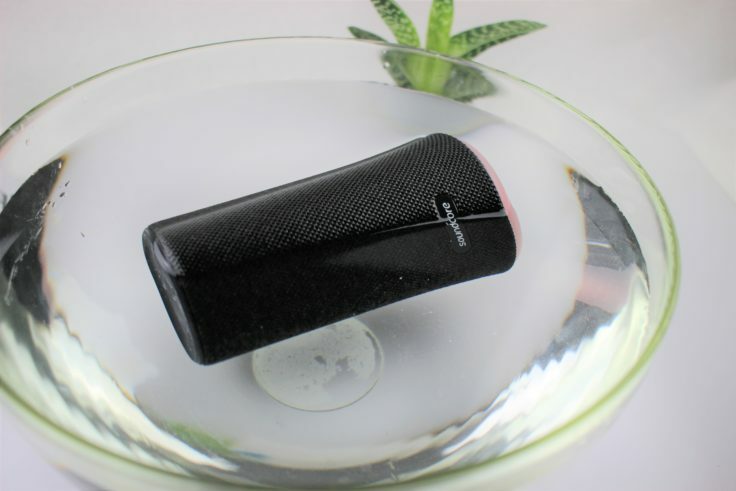 Thanks to IPX7 protection and a passed underwater test, it is rightly called the Outdoor Speaker and continues to play happily, even when it lands in the pool, lake or sea. Due to the waterproof surface of the Soundcore Flare, the bass is unfortunately less powerful than the Tronsmart T6 or JKR KR – 1000. However, this is the case with most outdoor speakers and should therefore not be a point of criticism. You should decide in advance, strong bass or suitable for outdoor use. 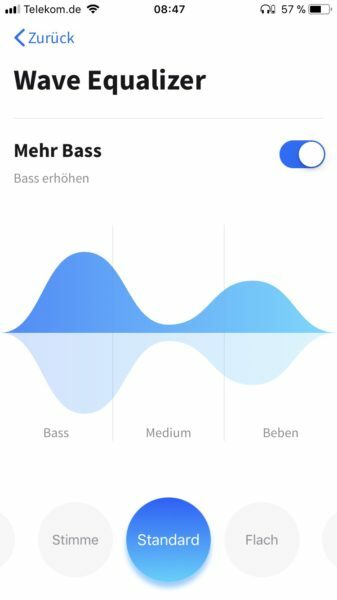 However, there is nothing to complain about in the high and mid range and thanks to some equalizer presets in the App and BassUp modes there is even some room for modifications of the sound.